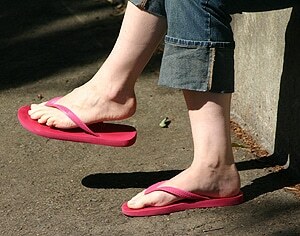 Contrary to popular belief, thongs may actually be good for children’s feet. Angus Chard, from the University’s Footwear Research Group within the Faculty of Health Sciences, examined the motions of children walking and jogging in thongs and found their foot and ankle motion to be more similar to bare foot motion than other shoes. The results, presented yesterday at the International Foot and Ankle Biomechanics (i-FAB) Conference at the University of Sydney, indicate thongs are not necessarily bad for children’s development and could in fact be better than other shoes. “There’s a lot of anecdotal opinion that thongs are bad for children’s feet, but contrary to that we’ve found that walking and jogging in thongs is very similar to walking and jogging barefoot, except for some compensations necessary to keep the thongs on,” says Angus. “It’s been shown in epidemiological studies that children who have grown up without shoes have a lesser incidence of flat feet and toe deformities, so there’s strong support for the argument that bare feet are the best model of footwear,” he says. Angus and his team used state of the art 3D camera motion analysis technology, similar to that used in the films Happy Feet and the Lord of the Rings trilogy, to accurately observe the foot motions of 13 children aged eight to 13. “Compensations required to make sure the thong stays on may lead to muscle overuse injuries with prolonged wear, but they may also assist in some strengthening effects,” says Angus. The next step in Angus’ research is to look at the effect thongs have on the kinetics or joint powers produced when children wear thongs, which will help us gain further insight into pathology that might be related to thongs. “I’m a podiatrist and there’s no shortage of public opinion or parents’ concern on whether or not thongs are bad for children’s feet. Most parents are under the impression that they’re bad. While we can’t yet necessarily say they’re good for children’s development, we certainly haven’t found any reasons to discourage children from wearing thongs for short periods,” he says. Having practised as a podiatrist for almost 20 years, Angus returned to university to try and close the gap between clinical experience and evidence-based medicine. “After 19 years I felt like I had enough questions to ask to return to university. We need to draw from both our experience as clinicians and from evidence-based medicine to offer patients the full range of treatment options available to them,” Angus says. The third international foot and ankle biomechanics congress (i-FAB2012) is hosted by Associate Professor Joshua Burns from the University of Sydney’s Faculty of Health Sciences in collaboration with the International Foot and Ankle Biomechanics community, and runs from 11 to 13 April. The program covers both basic and clinical aspects of foot and ankle biomechanics from the perspectives of podiatrists, physiotherapists, orthopaedic surgeons, biomedical engineers, athletic trainers, biomechanists and other allied health professionals. i-FAB2012 has attracted almost 300 speakers and delegates from 22 countries, who will present four workshops, six keynote and invited addresses, 55 podium papers and 33 posters over the three days.